To the appropriate background strains of ‘Crazy Nights’, Turid, Anne Marit , Solveig and Marianne took a well-deserved bow after playing yet another scintillating Katzenjammer show. 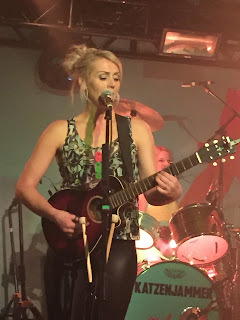 For this, their second batch of UK venue dates in 2015, the intoxicating Norwegian quartet included Birmingham on the schedule and thus the first chance for many West Midlands fans to hear the songs from the new album ROCKLAND live. Disappointment was not on the agenda as the girls literally weaved through a chaotic set lasting just over ninety minutes and exuding gallons of exciting, mainly acoustic mayhem. 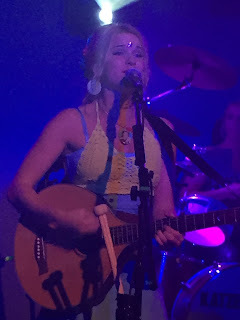 First time fans were literally blown away, while seasoned Katzenjammer watchers probably never get to grips with the multitude of instrumental exchange and energetic buoyancy radiating from the stage. 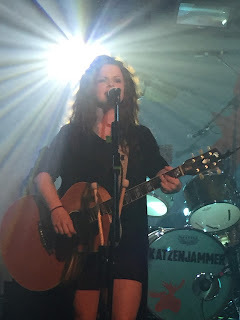 Although active as a band for ten years, Katzenjammer only came to my attention this year through an addiction to ROCKLAND, their third album, and a ground breaking show, well for me anyway, in Nottingham. Festival goers at Cambridge Folk and Cropedy also had the opportunity to see the band during the summer with it being unsurprising that fans on the folk and roots circuit have taken to their style of upbeat organic music. However it is difficult to believe how they can beat these indoor shows with a couple of hundred people packed into a smallish venue. The Library room at Birmingham Institute is ideally contained to capture the magic of a Katzenjammer show with the girls on full fifth gear power mode this evening. It was a Friday night and the band wasted no time in rousing the crowd with the smart choice of opening the set with the singalong favourite ‘Rock-Paper-Scissors’. The tone was established for a trawl though material from all three albums with ‘God’s Great Dust Storm’ and ‘Land of Confusion’ joining the opener as a representation from 2011's A KISS BEFORE YOU GO. There was an increased serving of songs from the LE POP record with numerous tracks vying for the show’s golden moment, or should we say moments. The final three songs before the encore all came from this 2009 record. 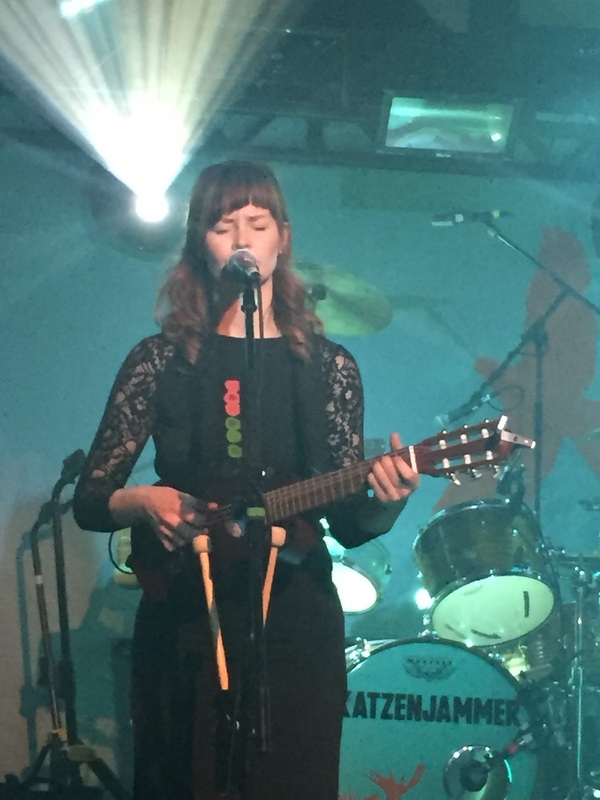 ‘Demon Kitty Rag’ signalled the start of the finale, before Solveig raised the atmosphere to crescendo levels when playing the trumpet parts in ‘A Bar in Amsterdam’. This was the cue for further creative use of the venue’s light system and Marianne slipping into demonic mode while wallowing in ‘Hey Ho on The Devil’s Back’ from the keyboards. Playing catch up with Katzenjammer’s previous albums has been highly enjoyable this year and an honourable mention is deserved for the live rendition of ‘Mother Superior’, also from LE POP and an inspirational piece of joyous accordion-led, European upbeat, sway-inducing bar music. Any review of a Katzenjammer show cannot fail to mention the continual exchange and array of musical instruments used. The number 18 has been read somewhere and that seemed about right, headed by the band’s cat-faced contra-bass Balalaika and pink piano, with electric bass being almost the odd one out amongst a concoction of acoustic. For so much on-stage manoeuvre and switching, the pauses are relatively short, with the wider Katzenjammer team precision-tuned in this operation. The songs from ROCKLAND were rolled out in a steady procession with perhaps one notable absentee being ‘Shine Like Neon Rays’ which did not grace the pink piano when it was brought out. Similarly to the Nottingham show, Marianne explained the background to ‘Lady Grey’, but a Katzenjammer show is defined by the musical chemistry rather than the between-song chat. To further this theory, ‘Old de Spain’, ‘Curvaceous Needs’ and ‘Bad Girl’ continue to evolve and excel in a live setting with the title track ‘Rockland’ being one of show’s occasional restful moments. Katzenjammer has been one of the finds of 2015 and has almost left a lasting legacy from seeing a couple of their shows. They are the epitome of the phrase ‘the sum is bigger than the parts’ with each band member playing near identical roles with only the odd instrumental exception. Truly egalitarian in their approach to music making, Turid, Solveig, Marianne and Anne Mariet have emerged as a treasured quartet and proudly present Katzenjammer as a band doing things the right way: skilfully, authentic, organic and totally enthralling.